“Hi, Neighbor.” If you’d forgotten the smiling face and gentle voice of the man who offered this greeting daily after he donned his signature cardigan and sneakers, recent reminders have cropped up everywhere. Fred Rogers, who died in 2003, made a posthumous comeback in this year’s popular documentary, Won’t You Be My Neighbor?…the recently released biography, The Good Neighbor: The Life and Work of Fred Rogers…and the upcoming movie, You Are My Friend, which stars Tom Hanks and will hit theaters in October 2019. 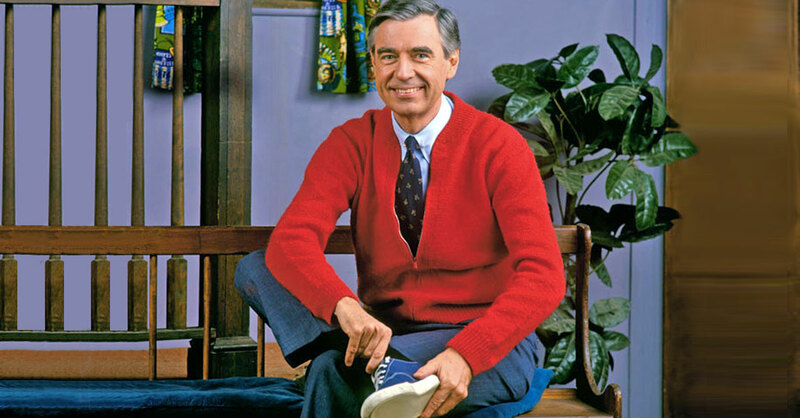 Fred Rogers instructed each of us to conduct our lives in our own unique way and also in a way that works harmoniously alongside others. He told children in every episode, “I like you just the way you are.” The not-so-hidden message: You need to like yourself, too. In one episode, he illustrated this message by drawing a hasty picture with crayons and holding it up for his pint-size audience, saying, “I’m not very good at it, but it doesn’t matter. It feels good to have made something.” If you love and accept yourself along with your imperfections, you’ll be kind to yourself. Both self-acceptance and kindness give you a strong foundation for confidence and compassion, which makes it much easier to be kind to other people. Fred Rogers didn’t minimize problems. He acknowledged that there are times when everything isn’t fine—that it’s OK to be sad, scared or hurt. That acknowledgment gives others a safe space to talk through their feelings, whether it’s about something ­personal—a ­divorce, illness—or professional, such as upheaval at work. Change is scary and often painful, even when it’s not something big and personal such as a divorce or illness. Regardless of the setting, it’s important to be patient with others. Listen and let them talk through their feelings without passing judgment. This helps people find acceptance about what is happening inside themselves. Rogers was the master of framing life in realistic but still positive and constructive terms. He was fond of sharing what his mother said whenever he saw scary things on the news. “Look for the helpers. You will always find people who are helping.” As adults, we are wise to remember this when we see a heart-breaking school shooting or natural ­disaster. Focusing on the first responders and Good Samaritans who step up in the face of tragedy reminds us that there are caring people in the world and helps restore our faith in humanity. Recently in my community there was a major fire at a beloved school. At first, everyone at the scene was filled with anger, sadness and frustration that this could happen. Then some of the parents began to create thank-you posters for all the different fire companies that responded to show the community’s gratitude. They were able to channel those negative emotions into something positive. At a time when it seems like there are all kinds of madness in the world, the one thing everyone can do is stay calm and in control of himself/herself. Say you’re late and stuck in highway traffic and someone flies by on the shoulder. The natural reaction is to get angry, and that’s OK—denying what happened is not the answer. Instead, Fred Rogers would suggest that you keep control by imagining what valid reasons a person might have for doing that. Perhaps the woman in the passenger seat needed to get to the hospital. That reframing of the situation makes you see the behavior as acceptable. Instead of blood flowing to the emotional part of your brain, you’ve rerouted it to the thinking part and calmed yourself down in the process. Fred Rogers helped people find the desire within themselves to be better. For example, if a doctor admonishes someone with a heart problem to stop smoking and exercise more to increase his odds of living longer, the patient may feel offended and often won’t take the advice. But if the doctor says, “If you stop smoking and exercise more, you’ll be able to play with your grandchildren longer without becoming short of breath and needing to rest,” the patient will be more likely to want to change his unhealthy behavior. The doctor phrasing the request like this appeals to the patient’s love of his grandchildren and comes off as less judgmental and more supportive. Whenever it comes to a sticky or polarizing issue, if you challenge someone aggressively, that person is going to feel even more strongly about his own opinion, even if it is wrong, because emotions override the facts. Instead, Rogers believed that by discussing differences of opinion in a respectful way, people can get to a better place together. If you get your point across in a civil, diplomatic way, you can change the chemistry in the room and bring everyone to a level of common ­human understanding and decency.